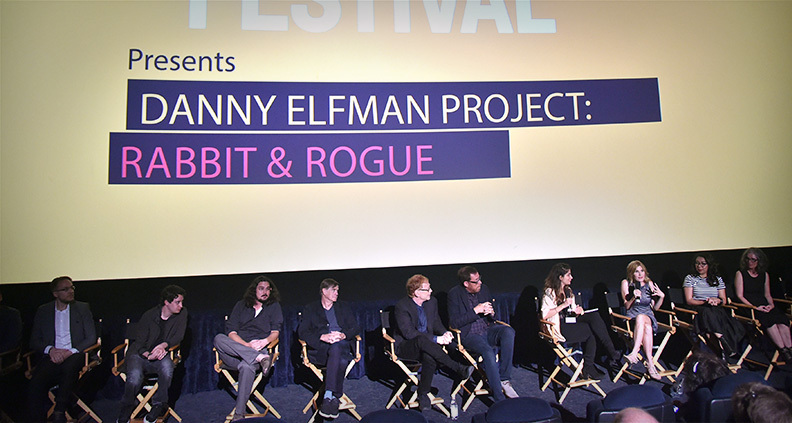 At last year’s 2016 LA Film Festival, Danny Elfman—acclaimed film composer and onetime Oingo Boingo frontman—announced the Danny Elfman Project: Rabbit & Rogue presented by the LA Film Festival, a competition giving filmmakers free use of music from his new composition, Rabbit & Rogue, for use in their own short films. The competition was presented in collaboration with Indi.com and left filmmakers plenty of room to be inspired by Elfman’s music. Winners were chosen by a panel of Blue Ribbon judges including Rob Minkoff (The Lion King, Stuart Little), Gus Van Sant (Good Will Hunting, Milk) and Paul Haggis (Crash, Million Dollar Baby)—to name a few. What’s more, the winners received the opportunity to premiere their shorts on June 15 at the 2017 LA Film Festival in front a live audience including Elfman and judges. Moderated by LA Film Festival Director of Programming Roya Rastegar, the screening was immediately followed by conversation with Elfman, Van Sant, Minkoff, Nicole Greenwood from Indi.com—as well as many of the filmmakers whose work was featured.“It was just really wonderful to see all the different kinds of things people would do with this kind of music that has no association with film whatsoever in its creation,” Elfman said. 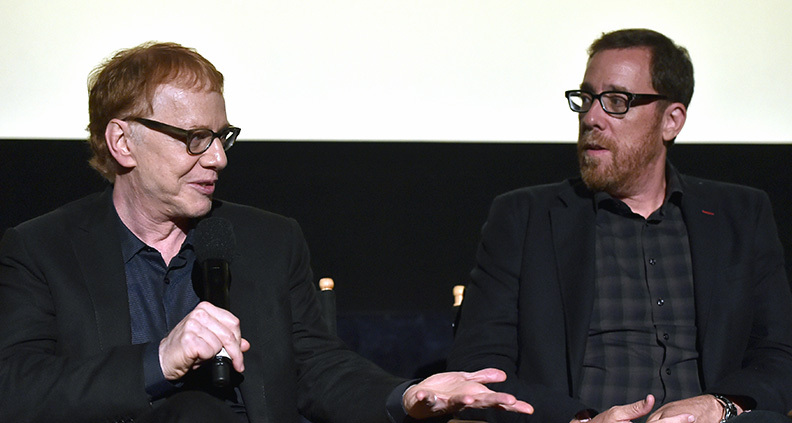 Minkoff assured the audience that working with Elfman was “incredibly exciting.” He continued to say that, since Elfman has the luxury of being able to choose what he does and doesn’t want to do, he was grateful to have any opportunity to collaborate. He explained that since music is such an important part of the storytelling process, the composer really becomes a partner in the movie. “You never know what the composer will do or bring,” he said. Travis Dixon, director of A Glory Sewn, about the adventures of a pair of socks, said he listened to every track on Rabbit & Rogue and wrote a script for each. He thought about how people would move and walk to the music, eventually arriving at the subject of feet, which he said he approached from a dancer’s perspective. Justine Quinones, director of 13, about a boy turning into a vampire, said that Elfman had been the soundtrack to her entire childhood. She said she knew she wanted to create a creepy story around a young boy turning into a vampire—something that was born of her deep admiration of Elfman’s past work. Sean Oliver, director of Natural Promotion, which follows a man’s transformation into a horrific man-rabbit, said he was actually more inspired by Rabbit & Rogue’s album art more than the music itself. He used a similar approach to Dixon, writing down ideas to each song. He wanted his film to cinematically dance while riding the peaks and the valleys of the song “Frolic”—which plays as his main character transforms. Mexican filmmaker J.B. Minerva directed A Day For Manuel, about an old man with a mundane life, who one day encounters the representation of Death. Minerva said that the moment he discovered the project on the Internet, he listened to “Gamelan.” It was then that the story for Manuel came to him in a moment he considers “magical.” “Discovering the themes and everything so fluidly made me feel like I was collaborating with Danny Elfman even though we never met each other,” he said. Douglass Gibbens directed Lakesong, about a girl who resents her grandfather after his passing, only to slowly come to terms with who he was and what really happened in his life. Once again “Gamelan” was the inspiration, as Gibbens wanted the music to guide the story rather than to simply stand as the score. 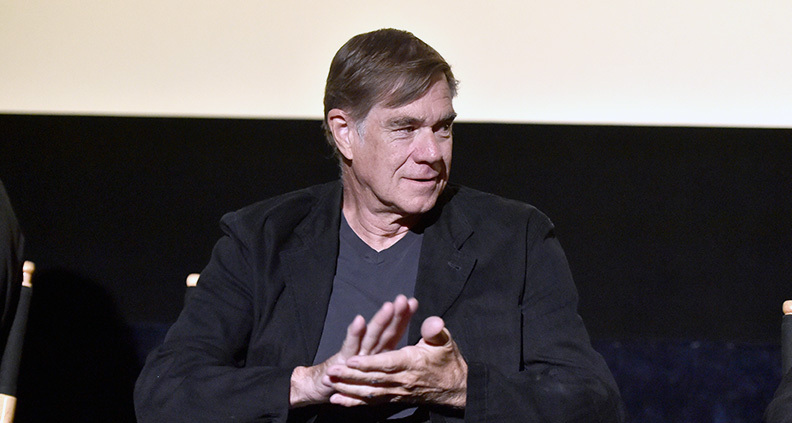 He described the process as an “interesting and dynamic challenge”—especially since he’d never taken a score and built a film on top of it before. Matt Eckholm, director of The Bridge, about a young woman’s efforts to convert a useless old bridge into something benefitting her community, said he was “definitely” inspired by Elfman’s longtime collaborator, Tim Burton. He knew from the beginning he wanted to do model work for the film, saying that if he didn’t enter this competition he’d regret it for the rest of his life. He was inspired by dramatic moments in Elfman’s “Rag” when putting together his narrative. Rastegar pointed out the theme of movement in each of the films and how each short had a similar interpretation of Elfman’s music: motion and/or transformation. It was exciting to see a diverse group of artists who—in a way— were already cosmically connected through their art and talents. But such collaboration would never have been possible without the LA Film Festival, Elfman and Indi.com.